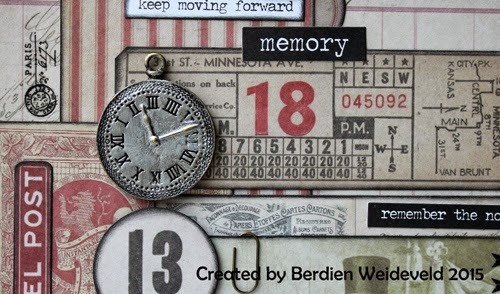 Hi, my name is Berdien Weideveld and I am very honoured to be asked to be today's guest designer on this blog ! I am 42 years old and married to William. 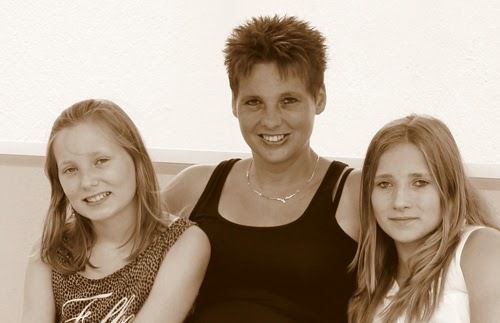 Together we have two very beautiful daughters: Celine, 15 years and Kyara, 13 years old. We live in a small village in the Netherlands. Approximately twelve years ago I started scrapbooking. 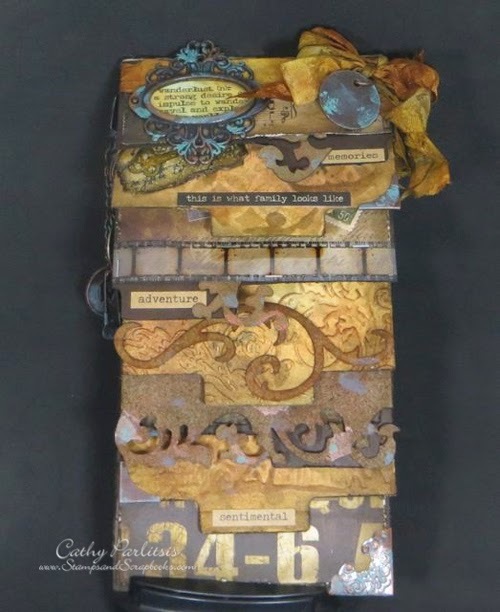 At first I scrapped only with photos, but when I discovered Tim Holtz on a creative scholarship four years ago, I was immediately in love with all his products and techniques. From that day I have ink on my fingers every day !!! 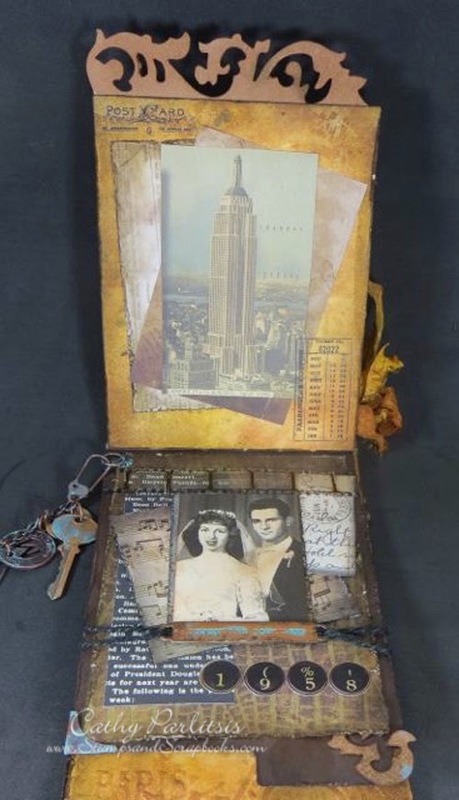 I made a collage of sorts Tim Holtz papers and ephemera, all edges are decorated with black distress ink. The clock was edited with silver paint. The key is punched out of chipboard and edited with silver embossing powder and black ink to give him a nice old look. As a finishing touch I made some rub-ons and chitchat texts. The title 'Remember the now' is a stamp. I have stamped the word 'now' an extra time, cut out and then applied with foam in 3d. I hope you all like my project and I wish to thank the Vintage Journey-team for this great opportunity that I got !! I’m so excited to be here! This blog and all of the incredibly talented designers have been a great source of inspiration for me. To be Guest Designing is certainly a thrill! I’m New York born and raised. 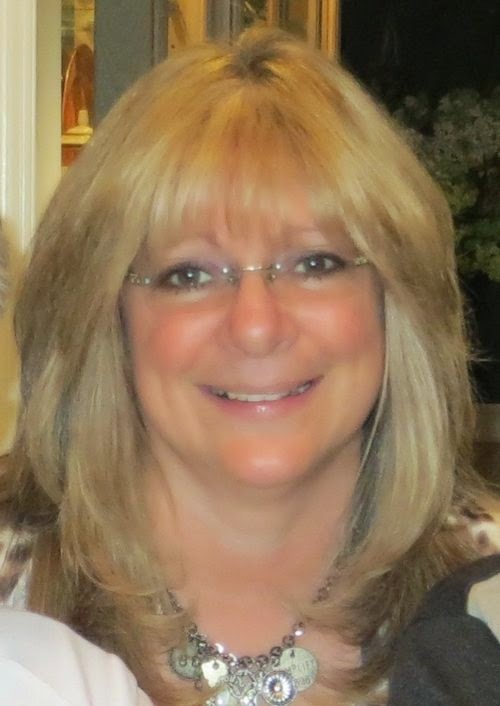 I live about an hour north of NYC – with my husband of 30 years. We’re new Empty Nesters and although I miss having the kids at home, it gives me a lot more time to craft! Before I found Paper Crafting 17 years ago, I always considered myself “Craft Impaired.” What originally began as a hobby quickly evolved into a full time passion! Card Making is definitely my first love but since I discovered Tim Holtz, I am obsessed with Distress! My husband calls Tim “My Boyfriend” because every time I see one of his techniques or products, I disappear into my craft room for hours – so he jokes that I must have “My Boyfriend” in there with me. ;) I create in all different styles but Vintage is my favorite. I loved my Grandmother and each time I create something “old,” it makes me think of her. I thought long and hard about what I could design for you that would be worthy of this honor. I love Tim and all of his techniques and I wanted to use every one of them along with all of his products! This project, sort of, started to create itself and then took on a life of its own. I hope you like it. Additional photos and instructions can be found on my blog – www.StampsAndScrapbooks.com. Project Description: This project is a lot easier than it appears. It uses 2 sheets of card stock cut down the center and scored at graduating intervals to create a cascade effect. 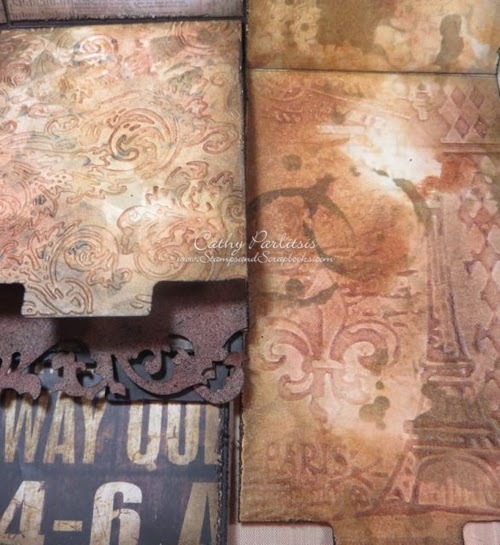 The Manila Cardstock is distressed with various colors of Distress Stains, Stencils and Embossing Folders. Distress Inks were applied through different stencils on all of the card stock pieces. Photos, Ephemera, Die Cuts, Remnant Rubs, Idea-ology Pieces, and other Tim “ Treats" were used to decorate the individual pages. Vintage Photo and Evergreen Bough Distress Paints were used to age the die cuts and charms. Finally, Linen Thread was used to “bind” the pages together. I am Rupa from Bangalore, India. It gives me great pleasure to be here as a guest and when Chris asked me if I could be one, there was no saying “NO”. I strongly believe in “Dreams Come true” and this is one! I found out about AVJ 6 months back and have been participating since then and a pin worthy twice in their challenges. A blog that inspires and influences me the most, it is such an honor to be here for their blogoversary! I have a mega altered, up cycled project which has loads of Distress and Vintage ( my fav words in crafting). Oh my! What would we do without those…I always feel anything can be altered with his wide range of products, what say?? My interest in arts started when I got married and had to set up my own house. I had a flair for interior decoration but no formal training, which is when I started learning various forms of art and painting just to decorate “my home” ! After the birth of my first son ( a child with special needs) I was forced to be a stay at home mom and that’s when my passion and hobby became work too. I started taking art classes from home and have been doing so last 10 yrs and still do. My son now is 16 yrs and I have a 5yr old daughter too and my entire family is very supportive of my passion. My entry into crafting was accidental 2yrs back when I just bought the Big Shot machine in an impulse. I discovered my style was Vintage with lots of textures and most importantly , altered art. My USP is up cycling and have hoarded a lot of trash at home and they all get their time to get pampered and have a new lease of life. I love doing 3D projects and today too I have an up cycled project where I have used a card board packaging box and a couple of empty brown tape rings to make a deco piece which can light up a table! To make the drift wood, I used a horizontal piece of box, made a few circular openings on the top ( you will see why in a while) and inserted the empty tape rings. I stuck layers of tissue paper and cheese cloth and then spread homemade texture paste with a spatula all around the box. Once dry, I took my first collection of Distress stains, picket fence, walnut stain, brushed pewter and weathered wood and applied them and voila, my lovely faux drift wood piece was ready. Doesn’t it look like it one of those pieces “washed off “the shore? For the front panel: I have printed this lovely table quote from the net on kitchen tissue and have adhered it on canvas cloth with gel medium. I aged the canvas with DI antique linen and Vintage photo and splattered black soot distress stain too. The edges have been given a shabby look by machine stitching. I have fastened the banner on the panel with TH hardware findings, which have been painted with black soot and brushed pewter D Stains and then “rusted up” using paper Artsy rusting powder. The side panels: I made a faux frame using garden twigs and painted it with picket fence and brushed pewter D stains. I then printed the table manners quote and then framed it behind the frame with an acetate sheet too from packaging. Simple embellishments here, with a resin star fish cracked up with picket fence distress crackle and then walnut stain to highlight the cracks. The back panel: A miniature banner that says it all. I dipped it in UTEE to get a glassy finish and have hung with natural twine. I have a thick layer of coconut coir for some dimension and texture here. I wanted the back to be simple to reveal the “faux texture” here. Looks good right? Floral embellishments in the front: I love making them! All these lovelies are made using mostly TH tarred florals, it’s amazing that you can make a wide range of flowers with this single die. One of my favorites and I can’t do without it! The foliage too is mainly TH and the lovely ferns are using Tattered lace die. The subtle colors of the flowers are all using distress inks and I wanted a soothing color palette on the drift wood, nothing too bright. I also did a “Tammy Tutterow” bow …colored the seam binding with DI and made the bow using her instructions to make a handmade bow maker! The butterfly was my first experiment with D stains. When I got the package, I just opened the package and tried out the marbling technique with the few colors that I have and ran a water color paper over. I took all the stains in a lovely rainbow pattern and I use the monarch butterfly die to get this one. One dip in UTEE and this delicate thing turned out to be a toughie! The little bee is a stamp and has been colored using D inks and sipped in UTEE too. A closer look and you can see the rusted hardware and a customized Ideology token! Do you see it hanging there, lol…yes I made that with a token die and D stains and wrote “avj” just so that it reminds me of this wonderful day! The entire piece weighs like real drift wood and some wooden feet colored with picket fence D stain helps it to balance well! The Top panel: is where the surprise is…remember the circular cut outs? What do you think it is for??? A closer look at the center and you can see a battery operated LED candle glowing beneath the lovely lotus! The back side with the lighting ”BON APPETIT”! Finally, the end is here. Thank you so much for putting up with my loooong post…I had to share every bit with you, after all it took me 4days to finish this! Thank you Chris, Brenda and the entire AVJ team for this opportunity and hope this satisfies your creative needs and makes you play along the “anything Tim” challenge. Happy Crafting and re cycling. A huge thank you to all three of you for taking the time to create us a special project for our birthday challenge month. It's so lovely to see three very different but amazing projects together. Please take a visit to these wonderful blogs to see more details and if you haven't joined us yet for our Anything Tim challenge you still have some time and it would be lovely to see you. Don't forget we have our ever wonderful sponsor Country View Crafts providing a £20 voucher for the winner, but there are also some other wonderful prizes donated by Tim and Mario for this month only for the Creative Guides Pinworthies selection and a special prize too for someone who has left a comment on the challenge post. Thank you so much for this opportunity. So happy to be featured amongst some amazing talents! Lovely projects from Berdien and Cathy. Hugs. Gorgeous creations by everyone!! Thanks for sharing your projects and story here! Awesome Projects by everyone. Rupa as always you rock with your out of box ideas...Kudos to you girlie!!! So happppy for you. Keep Rocking and Keep inspiring us dear!!! Rupa: You really deserved it !! Knowing your creative skills.. You create wonders from the day to day things we see .. Brilliant projects from you all and I loved finding out more about each one of you too!! Thanks so much for joining us here! Beautiful Creations Berdien , Cathy and Rupa !! loved all your projects and the inspiration !! Wow...all three guests and their creations are just awesome ...congratulations all ...n Rupa hats off to ur creativity n passion ...keep rocking girl ..!! Welcome Berdien, Cathy and Rupa - and thank you for sharing your wonderful and inspiring projects with us. Each one is unique and so creative! Congrats to all the Pinworthy guests! All the projects are stunning! Thank you for sharing these with us! Brilliant creations! I am really proud of your achievement! I am happy to see your work featured in your elite company! Berdien, Cathy and Rupa a huge congrats on being our first Pinworthy Guest Designers. You have all given us such a treat with beautiful projects and wonderful techniques.TFS, Hoping over to all your blogs now for a closer look. Congrats to all the VERY talented guests. Such an honor to have you follow and participate in our Vintage Journey. What amazing and beautiful creations from all the guest DT's, wonderful work! Congrats on your pinworthy mentions and thank you for sharing your talent with us all. So many wonderful projects from such winning talent! Love them all and happy to see you join us at AVJ.